It all started for me in 2002. I was walking along Southend high street and came across Southend Hospital Radio collecting donations. I knew from a young age I wanted to be a radio presenter and keen to find out more how I could do this I spoke with one of the volunteers. A couple of days later I handed in my application form and have been a member ever since. On my first day, just being 16 years old I visited the wards of the hospital collecting request from patients. I then compiled these requests on various formats (CD, Vinyl and MP3) to be played on the ‘Request Show’. I loved visiting the patients on the wards, they helped widen my knowledge of music from the 50’s, 60’s, 70’s but most importantly it gave me an idea of what the patients wanted to hear on the radio. For some patients, I was the only person they had spoken too all day so it was good to put a smile on a patient’s face. After a couple of weeks being on the ‘Request Show’ I was offered my own show on a Tuesday. I presented ‘Tuesday’s Music Mix’ for 5 years, some of which I co-presented with fellow member Jemma George before moving to Menorca, Spain. Whilst volunteering at Southend Hospital Radio and gaining the experience needed I was offered a job at Essex FM (now Heart Essex) which was my foot in the door at a commercial radio station. I then went onto presenting and working at national, commercial, local and community radio stations across the UK which became my career. 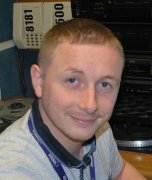 Without Southend Hospital Radio I wouldn’t have had anywhere local in Southend to live my dream to learn the basics of radio and gain an understanding of how a radio station works. I wouldn’t have had the chance to visit the patients to gain the music knowledge which I now use every weekend when I’m out with my mobile disco company. If you have an interest in radio or ever thought about being a presenter then please get in contact. We are always looking for volunteers to visit the wards of the hospital and also to help present radio shows. You never know it could lead to something, like it did for me! I wish you a speedy recovery and remember, we are your friend by your bedside.